You may remember when I introduced you to this mystery vegetable at the Portland Farmers’ Market several weeks ago. It’s a Jamaican Burr Gherkin, a miniature cucumber from West Africa. 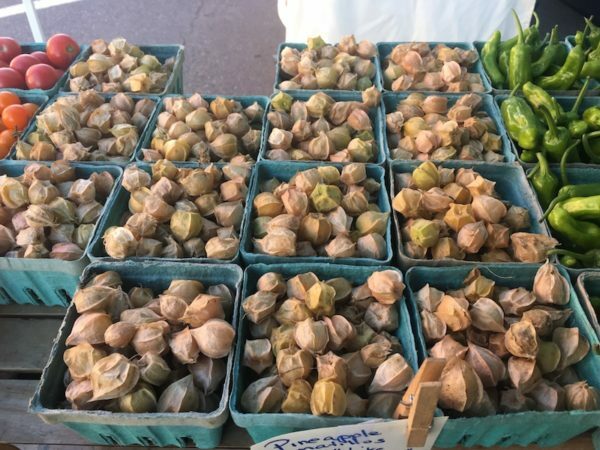 I discovered some more gherkins and a few other interesting vegetables recently at the Burlington, VT Farmers Market. (I get around, don’t I?) I also discovered something in Burlington that spoke to my sweet tooth. First, the healthy vegetables, then we can indulge! 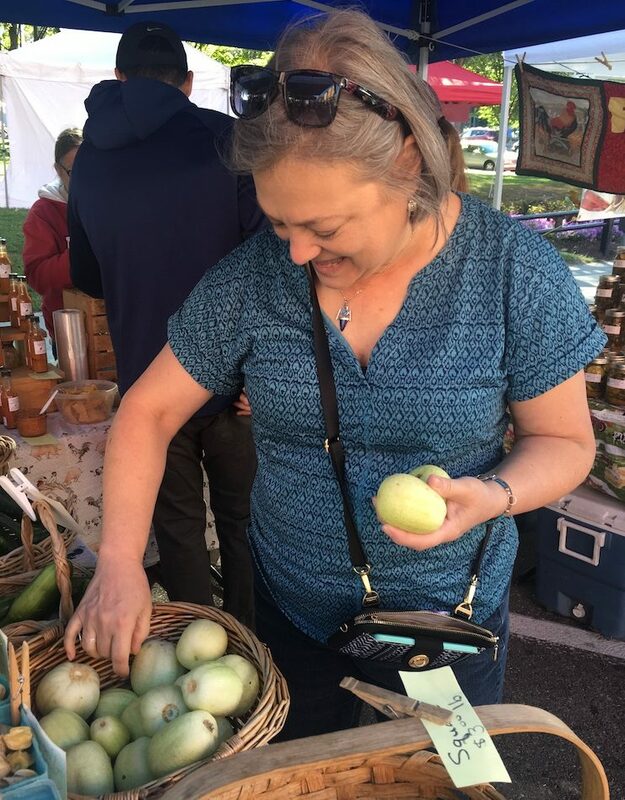 Karen Lebiecki is stocking up on lemon cucumber. 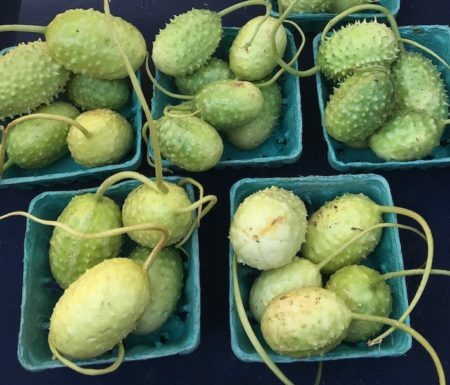 She says the first time she saw them she thought they were cukes that had overripened on the vine, but she was pleasantly surprised. They’re very crunchy and lovely and really fun because they don’t look like regular cucumbers so you can put them out and surprise everyone. I don’t do anything with them because I love the flavor of them so much that I just like to add them to a salad or put them out on a plate. Karen is also partial to these: Shishito peppers. I don’t know if a lot of people know about them. These are really fun. I love to grill them or sauté them. What’s fun about them is they’re fairly mild but about one in every nine is hot so it’s kind of a surprise. I like to grill them so they get nice and hot and blistered then just pop the whole thing in my mouth and pull it out with the stem. I think they’re great! After I finished talking to Karen, Erika Devincenzi poked her head into the stall and mentioned how much she loved Adam’s Gherkin Cucumbers. 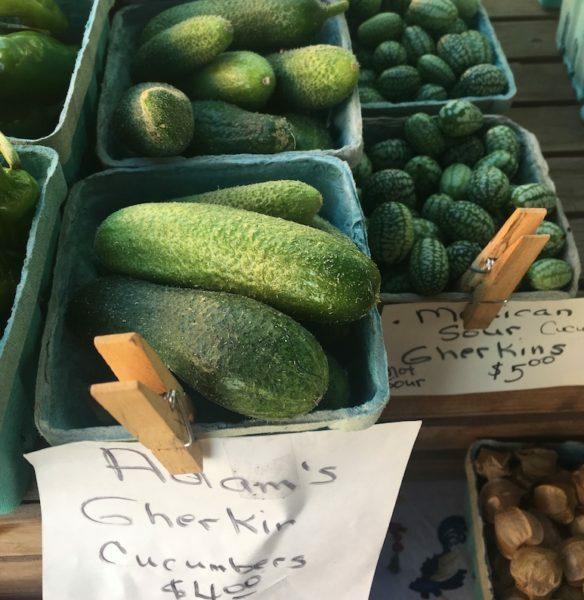 Those little things that look like miniature watermelons are also cucumbers — Mexican Sour Gherkins, but it’s the Adam’s that Erika likes. They’re crunchy and they’re kind of sweet and I just love them. I like them better than bigger cucumbers because they’re little and less seedy and they’re delicious. 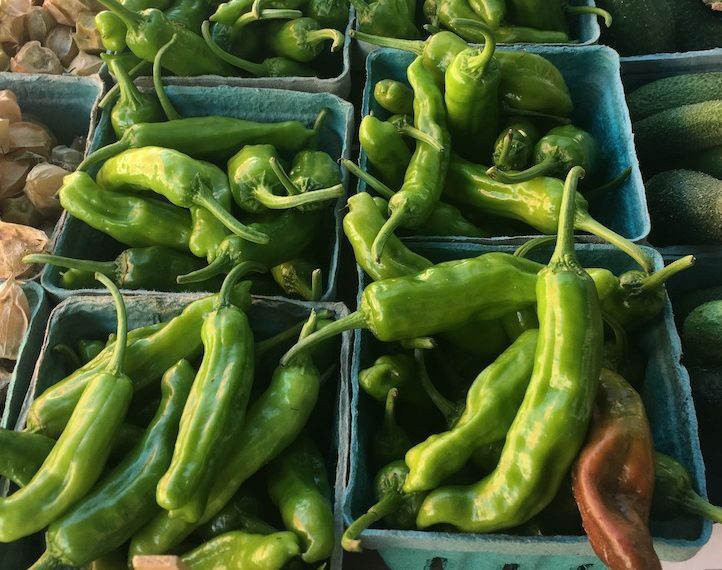 Another favorite of Erika’s are these delicate-seeming vegetables that are a staple of Mexico and known by several names. To her, they’re husk cherries and to others, they might be husk tomatoes or Mexican tomatoes. 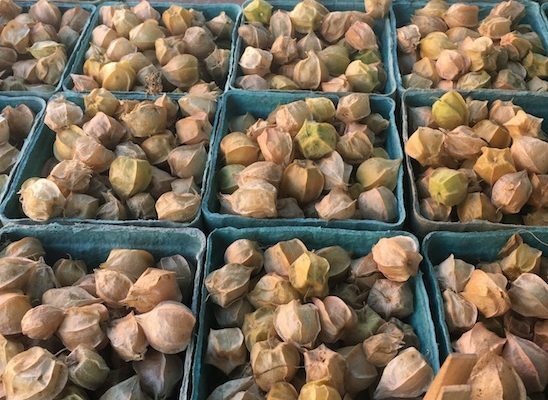 They’re tomatillos — pineapple tomatillos. They taste kind of tart. You break it out of the shell and pop it into your mouth. Sue Wells aka Farmer Sue doesn’t know how people are able to eat tomatillos raw. She grows and sells all of these lovely cukes and peppers and tomatillos. She prefers to stir-fry or roast her tomatillos or make some of her famous tomatillo salsa. She prefers to stir-fry or roast them OR make her famous tomatillo salsa. She also makes and sells a lot of different hot sauces. I love to grow hot peppers and thing I had to figure out what to do with them so I started making hot sauce. 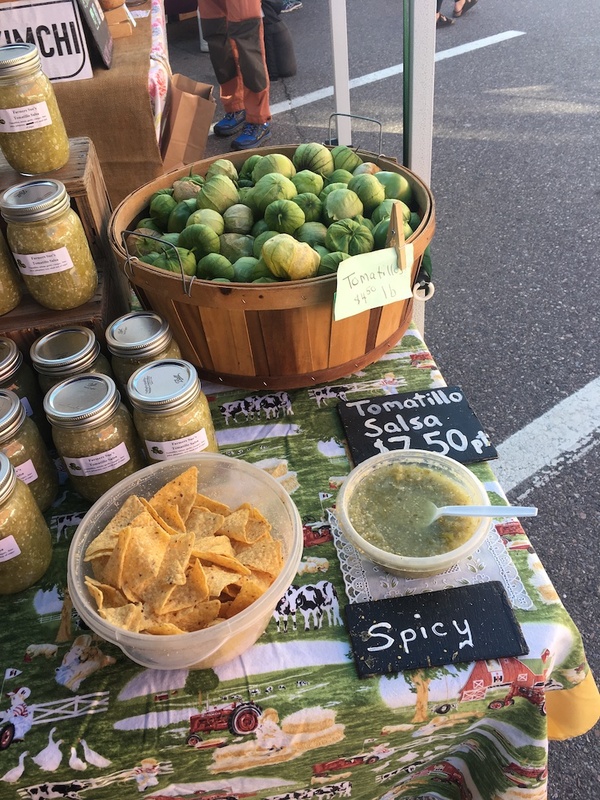 A favorite is the tomatillo salsa. 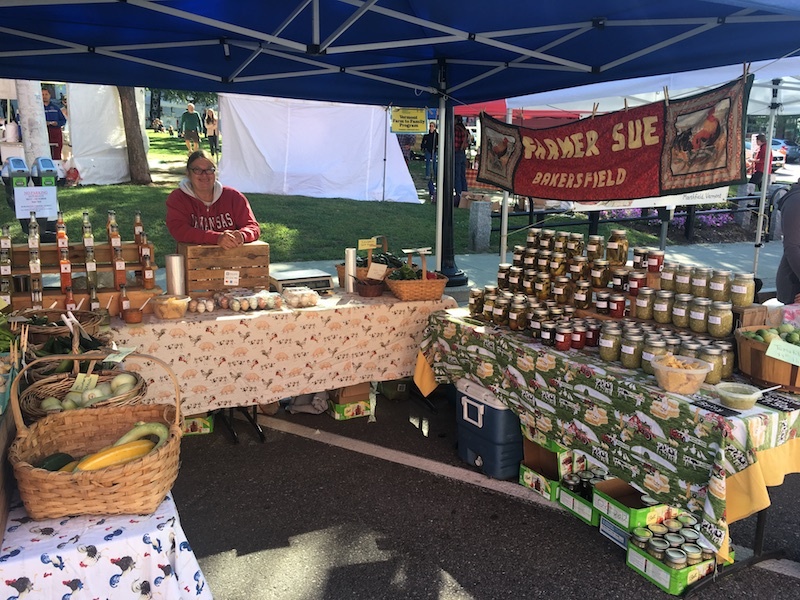 But Farmer Sue is not all about tomatillo salsa, hot pepper sauces, and interesting cukes. 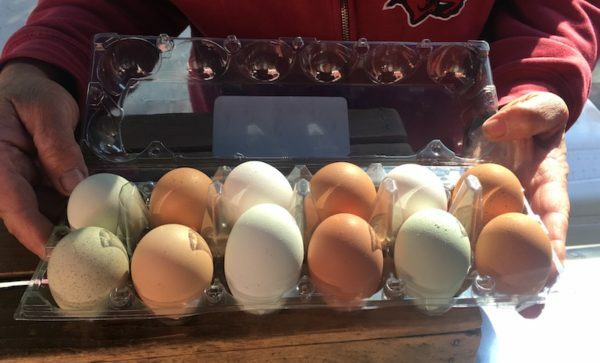 Don’t forget about my eggs! My eggs are beautiful. I feed them the best organic grain I can find and they’re free range. And now for that something sweet I promised you. It’s compliments of Erika who loves Farmer Sue’s healthy vegetables and also loves making toffee candy. 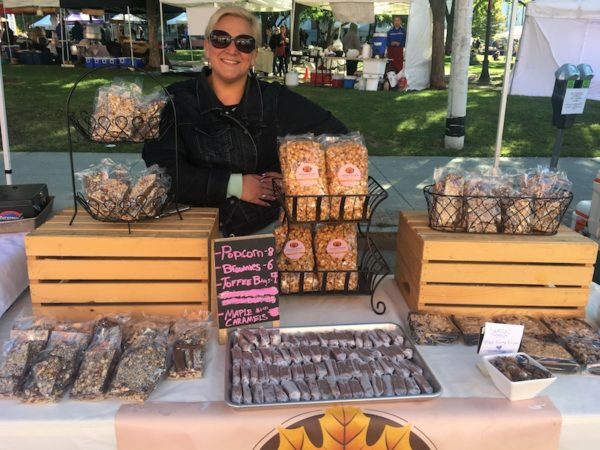 She was selling bags of toffee, maple caramels, toffee popcorn, and toffee brownies. I couldn’t help but mention how they were not quite as healthy as Sue’s vegetables. They’re gluten-free, though, and they’re handmade in small batches with really good ingredients! I’ve referred to cukes and peppers and tomatillos as vegetables, but are they? Technically, no. They’re fruits because they have seeds. Vegetables do not have seeds. I asked several people, none of them an expert if they considered a cucumber a fruit. Nope. Peppers? Nope. Tomatillos? Nope. What about you? I just love going to Farmer’s Markets. It’s early October here in New England and most will be winding down by the end of the month. If you’re lucky, you’ll find a wonderful winter market in your community. A never-ending supply of delicious, mostly healthy food (and sweets).